Follow the ancient trading routes from Athens and Mycenae to Jerusalem and Tel Aviv, threading Suez to Aqaba on the Red Sea and on to the source of pearls and frankincense in Arabia. Complimentary Three Veranda Suite Upgrade. 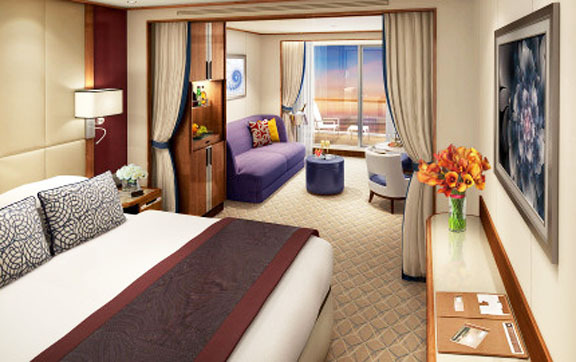 $1,000USD per suite shipboard credit on Penthouse and Premium Suites. * All prices quoted are PER PERSON in Australian Dollars and include taxes, fees and port expenses (if applicable). All prices quoted are for the cruise departing on 13Nov19. Prices for alternative departure dates may vary. Gratuities included. Open the door to your suite and step into a spacious vacation home, thoughtfully designed and tastefully decorated. A space filled with light and a myriad of delightful details prepared in anticipation of your arrival. An iced bottle of Champagne completes the picture-perfect welcome. The bed, with its plump pillows and fluffy duvet, will prove to be seductively comfortable, and the rest of the handsome furnishings invite you to relax, unwind, and entertain yourselves or friends in equally gracious ease. Like a ray of sunshine, your personal suite stewardess arrives with a doorbell chime, to ensure that everything is just as you wish, and offer you a choice of designer soaps. After today, she will demonstrate a genie-like ability to restore perfection to your suite without disturbing you in the least, and yet be cheerfully available if and when she is needed. All Seabourn suites share these appealing attributes. Choose from a range of suites in a variety of locations and sizes, including some with additional features to accommodate your personal preferences. However, one element never varies. Seabourn provides every guest in every suite exactly the same quality of service: the very best. What you may appreciate most, however, is your personal suite stewardess, whose thoughtful, unobtrusive service is delivered with care. Polished stone, gleaming hardware and sparkling mirrors highlight the bath, with a full tub, shower, and exclusive wellness products from Molton Brown, London. Suites aboard Seabourn Encore feature a comfortable living area, queen-size bed or two twin beds; walk-in closet with personal safe, interactive flat-screen TV with music and movies, fully–stocked bar and refrigerator, writing desk with personalized stationery, makeup vanity, spacious bathroom with separate tub and shower, plush robes, slippers, hair dryer and 110/220V AC outlets. Expansive ocean views, forward-facing windows, dining for four to six, whirlpool bathtub, guest bath, pantry with wet bar, two closets and two flat-screen TVs. Complimentary internet/Wi-Fi service. All Seabourn suites share these appealing attributes. Choose from a range of suites in a variety of locations and sizes, including some with additional features to accommodate your personal preferences. However, one element never varies. 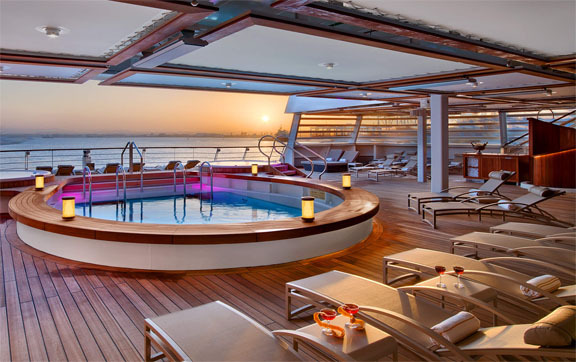 Seabourn provides every guest in every suite exactly the same quality of service: the very best. What you may appreciate most, however, is your personal suite stewardess, whose thoughtful, unobtrusive service is delivered with care. Forward-facing windows, dining for four, separate bedroom, guest bath, two flat-screen TVs, pantry with wet bar. Open the door to your suite and step into a spacious vacation home, thoughtfully designed and tastefully decorated. A space filled with light and a myriad of delightful details prepared in anticipation of your arrival. An iced bottle of Champagne completes the picture-perfect welcome. The bed, with its plump pillows and fluffy duvet, will prove to be seductively comfortable, and the rest of the handsome furnishings invite you to relax, unwind, and entertain yourselves or friends in equally gracious ease. Like a ray of sunshine, your personal suite stewardess arrives with a doorbell chime, to ensure that everything is just as you wish, and offer you a choice of designer soaps. After today, she will demonstrate a genie-like ability to restore perfection to your suite without disturbing you in the least, and yet be cheerfully available if and when she is needed. All Seabourn suites share these appealing attributes. Choose from a range of suites in a variety of locations and sizes, including some with additional features to accommodate your personal preferences. However, one element never varies. 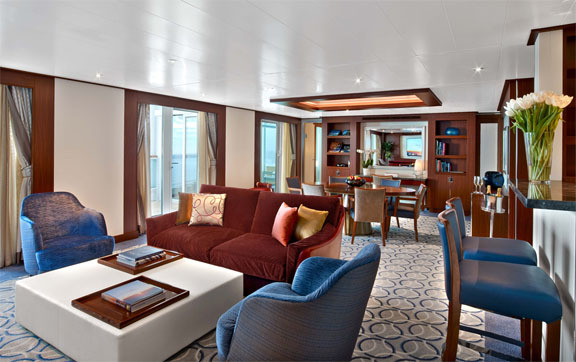 Seabourn provides every guest in every suite exactly the same quality of service: the very best. Large windows, dining for six, whirlpool bathtub, guest bath, convertible sofa bed for one, pantry with wet bar, glass-enclosed solarium with tub and day bed, two closets and two flat-screen TVs. Complimentary internet/Wi-Fi service. The Restaurant – traditional dining and is open for breakfast, lunch and dinner. The Colonnade – an indoor/outdoor restaurant with an open kitchen, serving breakfast, lunch and themed dinners. Patio Grill – casual poolside patio dining for breakfast, lunch and dinner. In-suite service – always available from our 24-hour suite service menu or, during dinner hours, served course by course from The Restaurant menu. Evening Under the Stars – Some of our signature events take advantage of the beautiful night sky. On deck, you may take part in an energetic, musical Evening Under the Stars® — sumptuous barbecue dinners or gala parties with live music and dancing. Shopping with the Chef – Spend an afternoon with a Seabourn chef visiting a local market. The Shops at Seabourn – It’s a great place to pick up a fashionable memento of your voyage or a gift for someone back home. Fitness Center – high performance Technogym equipment for cardio and strength training plus complimentary classes including yoga, Pilates and Tai Chi, as well as personal training (additional cost). 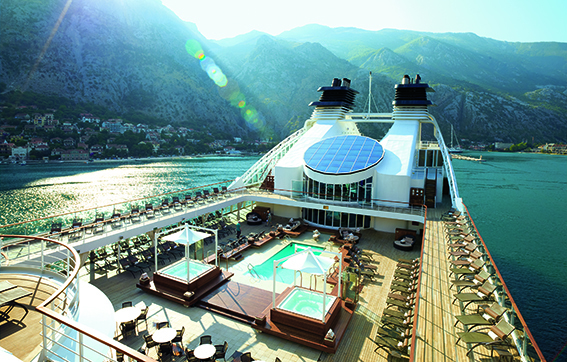 Seabourn pioneered small-ship, ultra luxury cruising, and continues to represent the pinnacle of that unique style of travel. Its fleet of intimate, all-suite ships, carrying between 458 and 600 guests each, sail to the world’s most desirable destinations at their peak seasons. On board, guests are served by an award-wining crew numbering nearly as many as the guests, hand-picked and extensively trained to deliver Seabourn’s signature style of thoughtful, personalized and heartfelt hospitality. Seabourn’s ships attract accomplished people who enjoy traveling well, and sharing fun and adventures with other interesting people. A great many of them have found the Seabourn cruise experience to be their preferred method of travel, and return regularly to sail with Seabourn again and again. 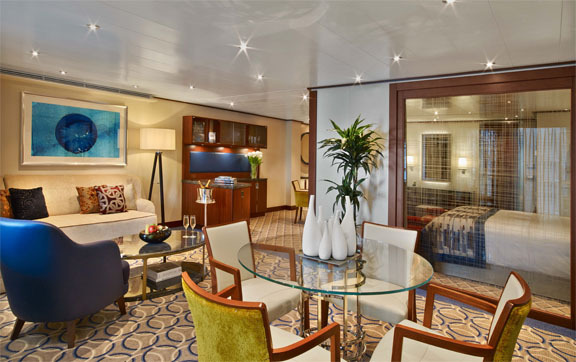 Intimate ships with no more than 300 suites. 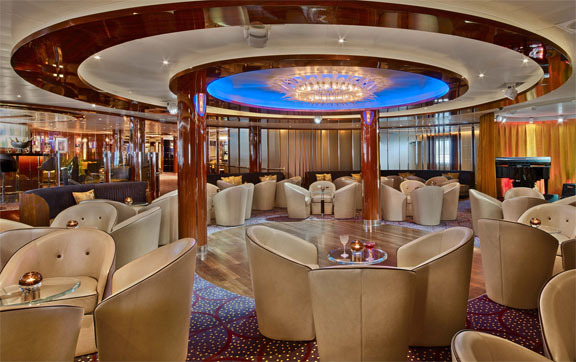 A Seabourn ship is like a private club, where members share expansive open decks, inviting social spaces, and the personalised attention of an exceptional crew. 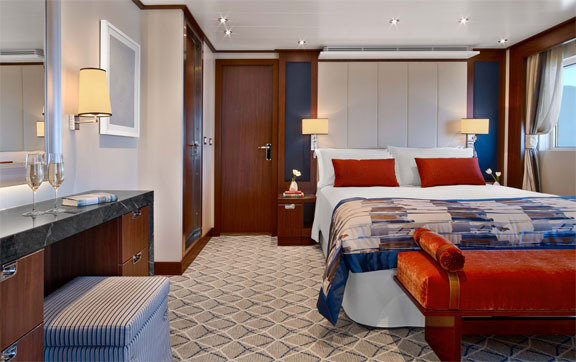 Step aboard any one of Seabourn's ships - Seabourn Odyssey, Seabourn Sojourn, Seabourn Quest, Seabourn Encore or Seabourn Ovation - and you'll enjoy a sophisticated and luxurious journey like no other. You will feel as though you’ve been invited to sail on a private yacht. 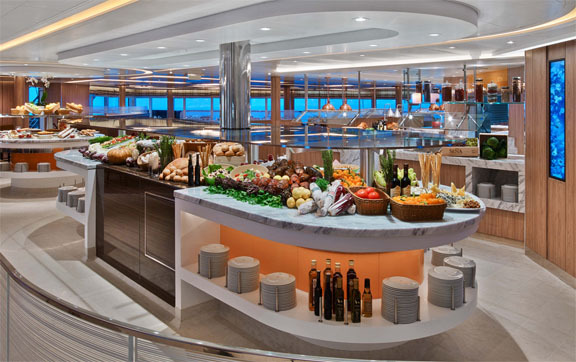 The freshest quality ingredients, including seasonal local specialties, are perfectly prepared to your order by Seabourn’s skilled chefs. 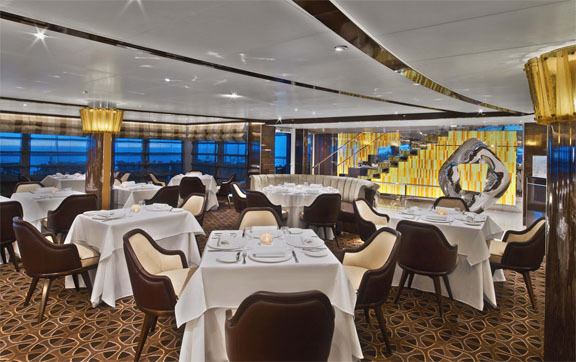 Masterful additions by Michelin-starred Chef Thomas Keller further elevate Seabourn’s cuisine, offering an unsurpassed dining experience unlike any other at sea. All dining venues are complimentary — dine where, when and with whom you wish.